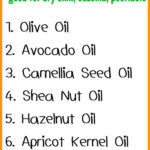 10 Carrier Oils High in Linoleic Acid for Acne & Oily Skin - beautymunsta - free natural beauty hacks and more! Discover these carrier oils high in linoleic acid for acne & oily skin. 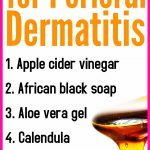 They’re especially beneficial for those with oily skin and acne for reasons we shall see below! Linoleic acid is an unsaturated acid, also omega 6 fatty acid. 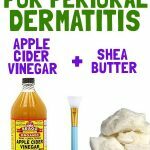 It is popularly added to skin care products because of its many beauty benefits that include: anti-inflammatory properties, reducing acne, retaining moisture in the skin and others. Recently, a study published in the Journal of the American Academy of Dermatology, says that acne patients have been shown to have low levels of linoleic acid in their skin surface lipids – a.k.a sebum. Carrier oils high in linoleic acid should be used by people with acne prone and oily skin. People with such skin types actually have more oleic acid and less linoleic acid in their sebum. This makes their sebum thick and sticky which blocks pores and leads to breakouts. Low levels of linoleic acid in the skin also leads to more oil production. 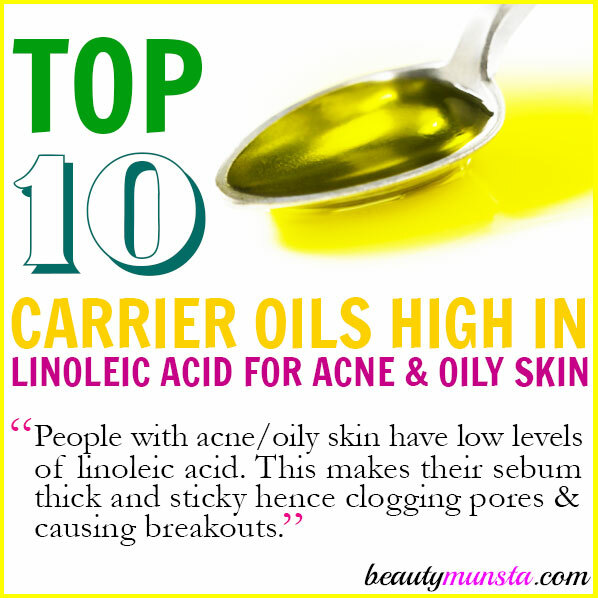 Okay, let’s check out the top 10 carrier oils high in linoleic acid for acne & oily skin! Important Note: I’m also listing the comedogenic ratings of each oil to give you an idea of what oil you think will best suit your skin type. Comedogenic rating is a scale of 0-5 showing how much an oil can clog up your pores. However, it all depends on your skin type, for example, rosehip oil has a comedogenic rating of 2 but contains excellent levels of linoleic oil, which may be very beneficial for controlling breakouts in some people. It’s also very good for reducing acne scars, so if you’re skin is acne prone and filled with scars, go ahead and use rosehip oil. On the other hand, if you experience a lot of clogged pores and comedones on your skin, I’d suggest using a non-comedogenic but high linoleic acid oil such as safflower/sunflower oils. Safflower oil (where to get it) is a perfect choice for severely acne prone skin and those with comedones and clogged up pores. That’s because of its non-comedogenic rating. It also has a nice smooth texture that can be used on its own. Evening primrose oil (where to get it) is a known hormone-balancer. It’s a miracle worker for those suffering from hormonal acne. I like pricking an evening primrose oil capsule using a safety pin and rubbing the oil directly on the skin. You can also use it straight up on acne bumps instead of applying it on your whole face. 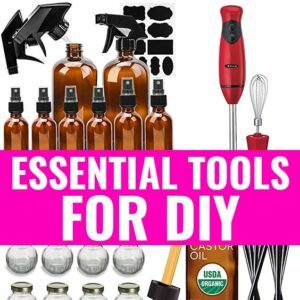 This budget-friendly oil is a good one to try out if you’re new to using linoleic acid oils on your skin. Grapeseed oil (where to get it) has a super light consistency that won’t feel greasy on your skin at all. It’s a good choice for those of you who dislike putting heavy coating moisturizers on your skin. Sunflower oil (where to get it) is much like safflower oil. It also has a comedogenic rating of zero, which makes it totally safe for acne & oily skin types. It has a neutral scent and silky texture so you can use it as a straight up moisturizer. This oil is also more commonly known as Barbary fig seed oil. They’re both the same oils. What I love about prickly pear oil (where to get it) is that it has a nice light texture, incredible anti-aging properties PLUS it has a comedogenic rating of zero! To top it off, it has a high linoleic acid content. This oil is definitely one of my fav oils and I absolutely recommend it if you’re suffering from oily/acne prone skin. Pumpkin seed oil (where to get it) is a less known oil but it’s also great for skin! I wrote about 9 Beauty Benefits of Pumpkin Seed Oil for Skin, Hair & Nails not long ago. It shows how amazing pumpkin seed oil is for your skin. You can use it as a spot treatment or combine a few drops in your usual moisturizer to boost its nourishing properties. Black seed oil (where to get it) is one of my best oils ever. I strive to take a tsp everyday as a healing tonic. It is very antibacterial and offers numerous benefits for skin and hair. For battling acne and balancing sebum, I recommend using it in your DIY oil cleansing method blend. Just add a few drops, not more: In a flip top bottle, add ¼ cup of grapeseed oil and 1 tbsp of black seed oil. Store in your bathroom cabinet and use as a facial cleanser. 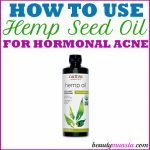 Hemp seed oil (where to get it) is amazing because it also has a comedogenic rating of zero. It helps regulates the production of high quality sebum and treats hormonal acne! Make a non-pore clogging facial moisturizer as follows: In an amber glass dropper bottle, add ¼ cup of hemp seed oil, 5 drops of geranium essential oil and 5 drops of clary sage essential oil. Apply 2-3 drops on your face to battle hormonal acne. You can even squeeze out oil from one evening primrose capsule for extra hormone-balancing effects. This golden gem of an oil is silky and luxurious AND has a comedogenic rating of zero! What more could you want?! Argan oil ( where to get it) also has a linoleic acid content of 37% so it’s good for balancing sebum while keeping your skin smooth and supple. Rosehip oil (where to get it) is great for acne scars plus it has a good linoleic acid content. It also has a comedogenic rating of 2, which isn’t bad for you but makes it not that desirable for acne affected skin. However, I suggest using it as a spot treatment on your acne and acne scars for good results! Before using any oil, first do a patch test so you can check if your skin will tolerate that oil or not. 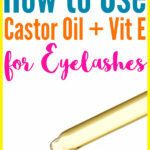 If you notice any irritation while doing the patch test, then do not use the oil as you might be allergic.